During one of the most shameful periods in Hollywood history, what could have been James Whale’s finest hour instead became his downfall. As 1937 dawned, the director was huddled with writers R.C. Sherriff and Charles Kenyon in a back office at Universal, working on a film adaptation of Erich Maria Remarque’s novel, The Road Back. A sequel to his All Quiet on the Western Front, the book follows a group of emotionally battered ex-soldiers back to their homeland, a Germany wracked by widespread violence, hunger and misery in the years following the Great War. Both Whale and Sherriff had survived brutal action on the Western Front—Sherriff was severely wounded and Whale was captured and held prisoner for more than a year—and they were eager to paint a realistic portrait of the war’s bleak and grim consequences, even for those lucky enough to have lived through it. They hoped the film would carry a powerful message of peace and a warning not to make the same catastrophic mistake twice. After the success of the Oscar-winning All Quiet, Universal had optioned the rights to the second novel before it was even completed. But when the book fizzled out commercially, the studio set the film project aside. When it finally went ahead, the timing could not have been worse: As Whale and his writers toiled away on their cautionary tale, the German war machine, under Adolf Hitler, was already groaning and cranking to life once more. And the film would soon be in the hands of one of Hitler’s minions. 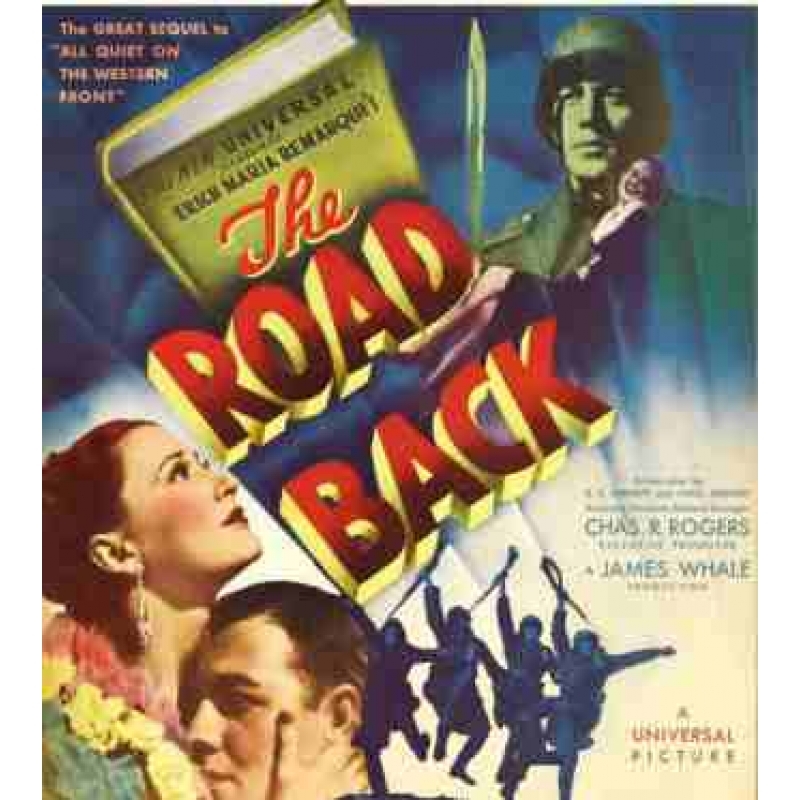 As a novel, The Road Back had already been banned by the Nazis, and they were none too eager to see it writ large on the big screen. In the book, Remarque describes the horrors on the homefront just as vividly as he had laid out those on the battlefield: Former comrades turn on one another in a village wracked by starvation, a returning hero’s fiancee betrays him with a profiteer, and a political activist is gunned down by his former commanding officer during a food riot. This was the very antithesis of the kind of propaganda and pablum the Nazis were feeding the faithful back home. The movie marked the third collaboration between Whale and Sherriff, who also worked together on the film version of Sherriff’s Journey’s End, a powerful portrait of terrified, trench-bound soldiers bracing themselves for one final assault, and One More River, a searing social commentary based on John Galsworthy’s popular novel. Echoing a practice from his London stage days, Whale cast a group of relative unknowns in key roles, with mixed results. John “Dusty” King, known mostly for his work in Westerns, fails to come fully alive. 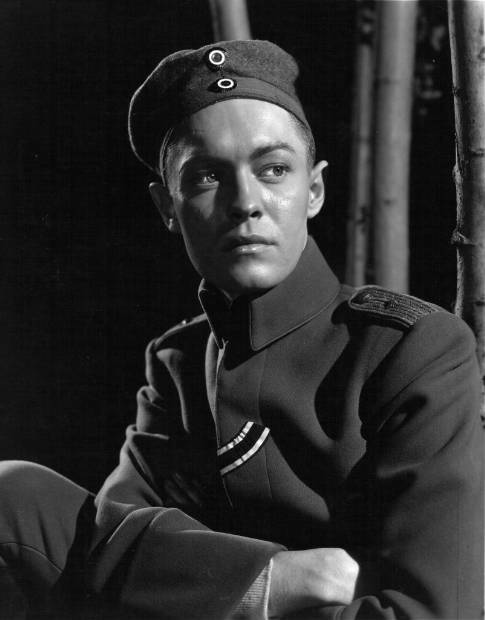 But Richard Cromwell—a gentle, sensitive actor perhaps most famous as the young man who duels with George Brent in Jezebel—picks up the emotional slack. Also featured are Andy Devine, who is truly touching even in his shtickier moments, and Slim Summerville, reprising his role as Tjaden from All Quiet. Having experienced more horror in a few short years than those back home could imagine in a lifetime, these men return from the battlefield more closely bound to one another than to their own families. And far from being welcomed as heroes, they are treated as little more than unwelcome reminders of a monstrous mistake that has left their country in ruins and its people bereft of hope or sympathy. Having helmed such classics as Waterloo Bridge, Frankenstein, The Invisible Man, The Bride of Frankenstein, and Show Boat, Whale was Universal’s top director. And with its $1 million budget, The Road Back was expected to be the crowning achievement of his career—a prestige project that would garner serious attention. And did it ever. But not the kind Whale or the studio were looking for. 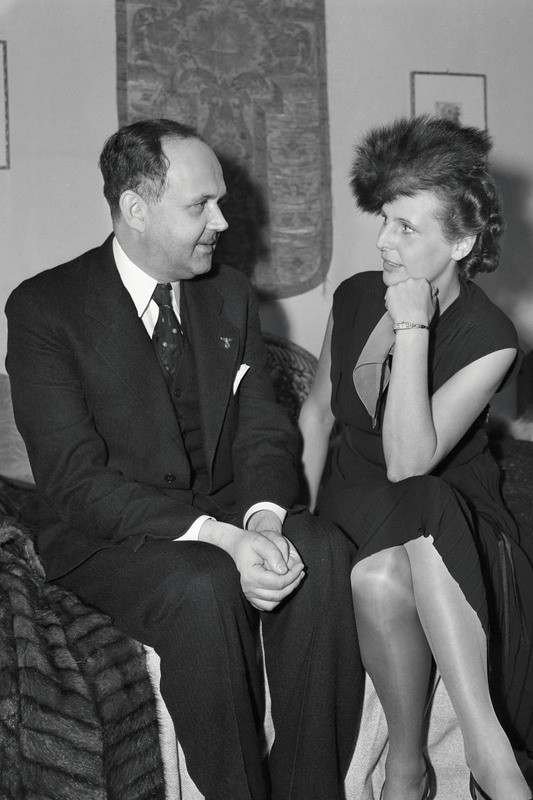 Georg Gyssling, the Third Reich’s consul in Los Angeles, had just one real job: to bully Hollywood into portraying Germany and its political regime in the best possible light. The main weapon in his arsenal was Article 15 of his country’s film regulations, which stated that producers whose work cast aspersions on Germany, its government or its people could have their permits to show films in Germany revoked—not just for their “offending” films, but for all their films. This sent shudders through the studio bosses, who feared the loss of this highly lucrative market. Doughy, bland and balding but supremely confident, Gyssling (below, gazing rapturously at the notorious Leni Riefenstahl) had competed for his country in the Four-Man Bobsled event at the 1932 Olympics. (Now there’s a business card: “Nazi Henchman/Bobsledder.”) He felt very much at home in his rarified surroundings, and he had reason to: Hollywood had proven to be quite pliable in the face of German threats to pull the plug on profits. And Universal was no exception. In 1930, shortly before the studio released All Quiet in Germany, the Nazis had strengthened their political foothold. And they hated the film’s anti-war tone and its portrayal of German soldiers as human beings rather than supermen. Joseph Goebbels himself railed against the movie from a theater balcony, and at later showings, Nazis released stink bombs in the aisles. Shortly after this uproar, the movie was banned in Germany. Panic-stricken, studio chief Carl Laemmle, himself a German Jew, agreed to make extensive cuts to the film—not just for the German market, but for worldwide distribution. He even took out ads in the German newspapers proclaiming, “I yield to no one in my love for the Fatherland.” After the government approved the new, whitewashed version, the film and Universal were welcomed back into the country. Having already banned The Road Back in novel form, the Nazis sent their boy Gyssling to go after the film, which was due out in the spring of 1937. His first stop: the executive offices of Charles Rogers, who had recently replaced Laemmle as head of Universal following a corporate takeover. Rogers believed he could talk Gyssling down (that’s how new he was) and suggested that the consul meet with Whale, who then invited him to his Santa Monica home to discuss the film. One can only imagine how much it galled the director, a former POW and a passionate progressive, to serve tea on the patio to a Nazi goon while pleading for the life of his film. But for the sake of his cherished project, he did. During the meeting, Whale stressed that the screenplay was not a mirror image of the book and that the consul should reserve judgment on the film for the time being. Gyssling lay low for a few weeks, until he saw a rough cut of the movie. Then, furious, he made a move even more thuggish than any he had made before. On April 1, 1937, he sent out letters to virtually everyone connected with the film—more than 60 people, from Whale and Rogers right on down to the wardrobe assistants—threatening to invoke the dreaded Article 15 and warning them that any future film on which they worked might be banned from the German market. Universal’s reaction was nauseatingly predictable. 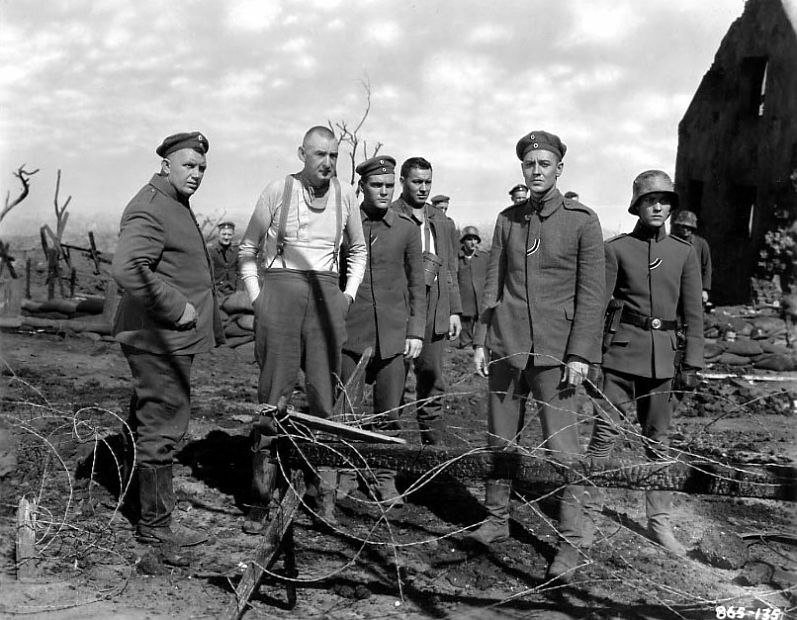 After some token resistance, the studio caved in to the Nazi government’s demands, “to cultivate the good will of Germany.” Rogers yanked Whale from the project and ordered parts of the film re-shot. The remainder was extensively re-edited, with a total of 21 deep and devastating cuts. Into the ashcan went all direct or even implied references to the Nazis—including the original ending, where, much to their horror, King and Cromwell come across a group of children being schooled in dogma that could have been lifted straight out of Mein Kampf. And here’s the kicker: After all of the studio’s appalling attempts to appease the Nazis, the film was banned in Germany anyway. Whale was disgusted by Universal’s utter spinelessness, and his relationship with Rogers was permanently poisoned. Spitefully squandering the studio’s greatest talent, the boss banished Whale to mostly B-films for the remainder of his contract. The director enjoyed just one more major success, with 1939’s The Man in the Iron Mask. Two years later, following the failure of They Dare Not Love, a romantic drama set, ironically, against the Nazi occupation of Austria, the one-time set designer retired from films and returned to painting, one of his earlier loves. No one could force him to slash anything from his canvases. All prints of Whale’s original cut of The Road Back were apparently destroyed. But critics and others who viewed it in previews generally liked what they saw. And even in its bastardized state, it has some striking Whale touches. The depth-of-field shots early on, where the battlefield seems to loom out endlessly before the soldiers. The delicate patterns of light and shadow. The long, fluid tracking shots that eventually peer in curiously for a closer look. At one point in the film, those who’ve miraculously made it through the war march side by side with their ghostly comrades. That’s the image that stays with me. Because the whole movie feels a bit like a ghost—a faint, mournful reminder of Whale, of what was, and of what might have been had his career not been derailed by a studio’s craven cowardice and greed. In the end, it doesn’t really matter whether Hollywood’s capitulation to the Third Reich is called collaboration—a word some people find inflammatory—or appeasement. The result was the same: the German government wielded significant power over many of the major studios for a good part of the 1930s. Fearing the loss of this lucrative market, a great number of studio bosses, to their everlasting shame, handed the editing shears over to this monstrous regime with disturbing regularity. Only later in the decade, when they were faced with the greater loss of film markets in England and France, did these studios summon the “courage” to shake off the German censors and take the battle directly to the Nazis. For many classic film fans and even some historians, this dark period in Hollywood is tough to face unflinchingly. It’s tempting to launch into denial mode and to shoot the admittedly imperfect messengers who’ve written books about it. But the archival evidence in both Germany and the U.S.—the only completely factual information we have—is overwhelming and indisputable. And the truth it reveals is an ugly one. For much more on the life and career of James Whale, read James Curtis’s extraordinary biography, James Whale: A New World of Gods and Monsters. Thanks very much for joining in. James Whale certainly received some of the shabbiest treatment that Hollywood could dish out. I appreciated the background and the extra details. Excellent review, thank you. I knew about the power of the isolationist lobby but I was unaware of the Nazi influence in Hollywood. It sounds completely repulsive but not surprising, the studio heads were driven by profits, not morality. And thanks for introducing Remarque’s sequel. I will be reading All Quiet on the Western Front soon in preparation to review the movie, so it will interesting to read his sequel. Thank you for sharing this story with us. We have to remember to stand up to bullies. I haven’t read the book or seen the movie, but I’ll put them both on my list. Wow – this is an excellent post. I had no idea about the story behind “The Road Back”. I’m really keen to see this now that I’ve read your review. very interesting historical background–what a shame when you know Whale could do magic… tampering with movies in the name of whatever ideology or political correctness deems good or bad at the time, usually makes either a mess or at best something bland.